Learn how PlusOne supports service driven pharmacies Register for our webinar session to see how recording services through our software can support your business model. Pharmacy Daily today has three pages of news plus a front cover wrap from Nivea. Fluoroquinolone alert THE Therapeutic Goods Administration has released details of an investigation into a rare but serious adverse event of aortic aneurysm/dissection associated with fluoroquinolone antibiotics. The TGA probe follows a Drug Safety Communication from the US Food and Drug Administration, as well as recommendations from the European Medicines Agency. Fluoroquinolone antibiotics marketed in Australia include ciprofloxacin, norfloxacin and moxifloxacin, with the TGA saying it had not received any Australian adverse events as reported overseas, but was continuing to monitor the situation closely. PHARMACISTS are being urged to put their votes behind “the major party that acknowledges the current problems” facing the Pharmaceutical Benefits Scheme (PBS) at the 18 May election. In a statement released today, former Pharmacy Guild of Australia South Australian Branch president, Ian Todd, hit out at the Coalition Government’s handling of the PBS. Todd, said he has been helping out at a rural pharmacy in Kingston, SA, recently and reported medicines shortages. “I’ve been at this for 35 years and I have never seen the catastrophic level of stock availability that I have over the last six months,” he said. “I know that there will be misadventure despite our best efforts and someone will die needlessly, either through mix-ups or lack of stock. 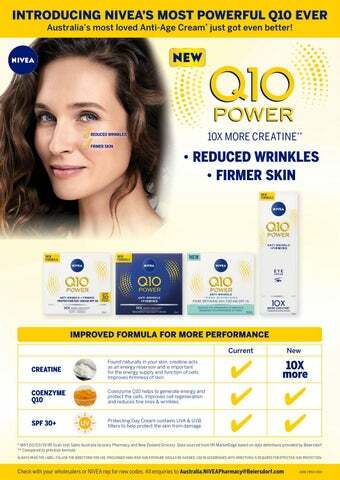 New formula Nivea NIVEA has unveiled the details of a new formulation for its popular Anti-Age Cream, having boosted the creatine content ten-fold to reduce wrinkles and firm skin. For details see the cover page. Always read the label and use only as directed. * Lidocaine (Lignocaine) 2.5% w/w Prilocaine 2.5% w/w provides skin analgesia for 2 to 4 hours1 Reference: 1. Data held on file at Ego Pharmaceuticals Pty Ltd.
MACKAY PHARMACIES FOR SALE BY EXPRESSIONS OF INTEREST These two iconic, central Mackay pharmacies present an excellent opportunity for an entrepreneurial pharmacist / group to expand their portfolio. NAPSA Charity Cup THIS year’s National Australian Pharmacy Students’ Association Charity Cup will raise funds for the Brain Tumour Alliance Australia, in honour of a South Australian pharmacy student recently diagnosed with glioblastoma. Cathy is the top point scorer for Round 5 of Pharmacy Daily’s NRL footy tipping competition. THE European Medicines Agency national health priority area”, has placed restrictions on the use and provide funding to embed of multiple sclerosis medicine pharmacists in healthcare teams, Lemtrada (alemtuzumab), linking particularly in residential aged care. it to reports of immune-mediated He also said an incoming isues and cardiovascular fatalities. government should accept This week the MBS Review Taskforce’s Pharmacy recommendation “to allow Daily & pharmacists to access allied health skinB5 items to provide medication are giving management services to patients away each with complex care requirements”, day their and align the incentives for NEW premium products Acne pharmacists to support rural and Control Australian Botanicals Pharmacy Daily remote communities with those Cleansing NRL tipping of other rural and remote health Mousse and competition is Acne Control sponsored by practitioners. Australian “It’s only logical that incentives GuildDigital, Botanicals with the top for other health professionals to Congratulations tipper for the Hydration go, to stay and to be educated in season winning a Essence GRACE the bush,ANDREW should be available to $1,000 gift card. valued at $85.90. pharmacists as well,” he said. Reducing falls GUILD Learning and Development is launching a new online training module to empower pharmacists to help minimise falls in older people. The new course, Reducing falls in older people, discusses the key risk factors that make older people susceptible to falls, and highlights the vital role pharmacists can play in cutting risks through medication reviews and lifestyle advice. The activity is accredited for one hour of Group 1 CPD, which can be converted to one hour of Group 2 CPD upon successful completion of relevant assessment activities. To enrol in the course visit: guilded.org.au, or call 03 9810 9930 for more information. essence uses 8 anti-acne Australian botanical extracts to effectively nourish, heal & restore a healthy skin barrier. Using cutting-edge cellular extraction, the ingredients’ natural powers are harnessed to deliver maximum benefits to your skin. For more info see www.skinB5. com. To win, be How many the first Australian extracts person are in the Australian from NSW Botanicals Hydration Essence? 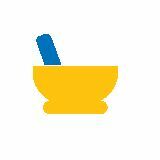 or ACT to send the correct answer to comp@ pharmacydaily.com.au Check here tomorrow for today’s winner. Register today to be a mentor, mentee or both! Dispensary Corner PHARMACISTS should take part in improv comedy sessions to help relieve stress and improve their communications skills, a US pharmacy academic believes. This is no joke - seriously! Betty Derza, a 2020 PharmD candidate at Rosalind Franklin University of Medicine and Science College of Pharmacy in Illinois, has published a paper encouraging pharmacy professionals to get silly and “smile until your cheeks hurt”. “When you watch people perform improv comedy, you laugh the entire time,” she said. “As health care providers, we undergo a large amount of stress on a daily basis. “When you enjoy a funny performance happening in front of you, you do not worry about all of the patients that you saw earlier in the day. Regularly smiling until your cheeks hurt can help prevent burnout.” The fast and unpredictable nature of improv is also perfect training for pharmacists, she added, because they regularly have to face unusual and unpredictable interactions with patients and colleagues within the healthcare professions. “Improv comedy tends to be silly and unrealistic,” Derza said. “Thinking of scenarios like this improves creativity, which is vital in health care...sometimes medical professionals need to think outside the box to save lives.” Maybe hours spent at comedy nights could be counted for CPD points, with performers earning Group 3 points for their skills or better still, could improv be funded under the 7CPA? Shock UK pharmacy apprentice proposal NEW British proposals to develop a five-year apprenticeship scheme for pharmacists have been blasted as “highly disruptive to the profession,” according to a report in the Pharmaceutical Journal. The plan was unveiled earlier this month by UK government body the Institute for Apprenticeships and Technical Education, after a submission by the Pharmacy Apprenticeship Trailblazer Group, an organisation representing a range of employers across the pharmacy sector including large retail chains, hospitals and pharmaceutical firms. Still at a “very explorative stage,” the proposal has been heavily criticised, with the Pharmacists’ Defence Association (PDA) saying it could lead to a “two-tier approach to qualifying as a pharmacist. “It would shift the profession away from a professional university-led model to a model traditionally associated with technical occupations,” PDA said. First-year apprentices in England are paid a low minimum wage but employers must fund university degree fees on their behalf. Pharmacy schools would be “engaged in the process” if the proposals are further developed. INVESTMENT needs to be made to support drug addiction services ahead of mandatory real-time prescription monitoring in Victoria, in 2020, an academic believes. Writing in The Conversation, Monash Addiction Research Centre Deputy Director, Suzanne Nielsen, warned the roll out of the SafeScript program could have unintended consequence, saying “we need to tread carefully”. “First, our health professionals and systems will need to be properly equipped to deal with the volume of people who will be identified by this program as needing support. “And second, evidence from the United States tells us restricting access to prescription drugs may drive people towards using illicit drugs instead,” she said. Neilsen noted that while the system would flag concerns to GPs and pharmacists, many were not confident talking about sensitive topics like substance abuse. “A doctor may choose to prescribe drug treatments, such as buprenorphine, for dependence to strong pain medicines,” she said. “They may also decide to refer the patient to a pain service, or a drug treatment service. “But where there are likely to be a greater volume of patients referred to these services, there are also significant concerns around access. “In Australia, there is a need to double the capacity of alcohol and drug treatment services to meet current needs,” Nielsen warned, adding that meant that if a referral was made there could be delays in accessing care. Weekly Comment Welcome to Pharmacy Daily’s weekly comment feature. This week’s contributor is Kimberley Nieuwenhuize, Digital Marketing Specialist at instigo pharmacy consulting. Creating content for your pharmacy’s social media HAVING a social media presence for your pharmacy is one thing, but making sure it stays updated consistently with relevant content is really where you start seeing rewards. Your social media profile should be an extension of your physical pharmacy; posting regular content shows current and potential customers that you are open for business! Content is the most effective when it is sociable, emotive, relatable and personal. You want to illicit a reaction from your audience that encourages them to engage with and connect to your pharmacy, and keeps your brand front of mind. You also want to stand out from the crowd. Remember, your customer’s news feed is likely to be full of posts from their friends, family and other brands, so being different and memorable is crucial to being noticed in a busy news feed. Posting photos is the best place to start when it comes to creating unique social media content. Customers love content with very personal touches, so staff profiles, birthday celebrations, and photos of engagement with the wider community are all great starting points for a fantastic post. If you want to use your social media to advertise products and services, share a photo of a staff member holding the product or demonstrating the service for your own personalised advertisement.